The Lexus NX is a good compact luxury SUV with a bold design, stellar interior, comfortable ride and plenty of standard safety features. You will miss Apple CarPlay & Android Auto. Excellent collection of standard safety features. Less cargo space than the competition. The 2018 Lexus NX is a bold compact luxury SUV with performance to back up the style. It is a perfect fit for buyers that want something smaller than the Lexus RX without sacrificing much more than cargo room. 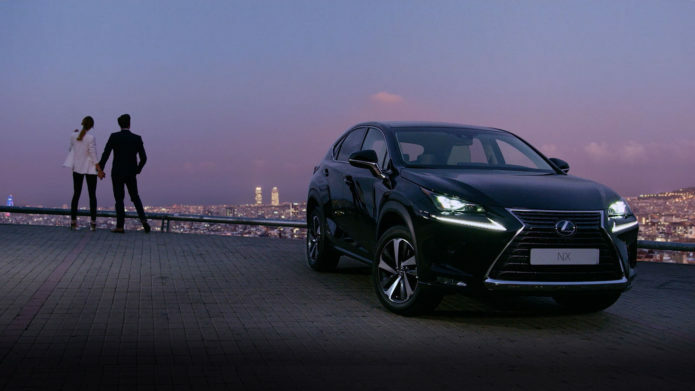 Available in the standard NX 300 trim level which is very well equipped, as the Lexus NX 300h as a hybrid and in a performance version with the Lexus NX 300 F-Sport, there are options to fit the needs of a wide range of drivers and situations. Is the 2018 Lexus NX a Good SUV? The 2018 Lexus NX is a good compact luxury SUV. The 2018 Lexux NX is a good compact luxury SUV with great styling, good handling and performance and a lot of standard safety and convenience features. Inside, the compact SUV is luxurious, but you give up some backseat space and cargo room from the Lexus RX. One major drawback is the infotainment system. While it is updated for 2018 with a larger screen and touchpad, it’s still frustrating to use while driving. There is also no support for Apple CarPlay or Android Auto. Helping the case is the Lexus NX’s track record of reliability and good resale value. Buyers should consider cross shopping the 2019 Acura RDX, Volvo XC60 and Infiniti QX50. The Lexus NX 200t is now the Lexus NX 300, but overall this is the same vehicle under the hood. The interior and exterior are both updated from the NX 200t that it replaces. New for 2018 is the Lexus Safety System+ standard and a bigger infotainment screen and Remote Touch Control. If you opt for the F-Sport, you can add on adaptive suspension dampers. I tested the 2018 Lexus NX 300 all-wheel drive with the Cold Weather Package, upgraded rear view mirror, Navigation Package with upgraded 10 speaker premium sound and the Premium Package that upgrades to 18″ wheels, heated and cooled front seats, LED daytime running lights, Blind Spot monitoring, and other upgrades. The 2018 Lexus NX retails for $44,920 as tested. The 2018 Lexus NX handles well and is geared towards comfort. The Lexus NX 300 handles nicely and is focused on delivering a comfortable, composed drive in the standard configuration. There’s enough power on tap that you never feel sluggish or want for quicker acceleration to merge into traffic. It’s not a super engaging drive, but you can upgrade to a sportier version if you pick the Lexus NX 300 F Sport with adaptive variable suspension and a bolder exterior look as well. The BMW X3 offers a more engaging drive if that is a high priority. I like that the 2018 Lexus NX doesn’t try to be too many things at once. It excels at being a good compact SUV that absorbs road bumps and keeps most of the road noise at bay while you get around town and hit the highway. The 2018 Lexus NX is rated for 22 MPG city, 28 MPG highway and a combined 24 MPG. If you need better fuel economy, look at the NX 300h, which delivers an estimated 33 MPG city, 30 MPG highway and 31 MPG combined. The Lexus NX features a bold design. The new look of the 2018 Lexus NX is bold. The front end stands out with a very pronounced nose. This definitely falls into a love it or hate it style. While I love the grille, the nose ends up more pronounced than I’d like. That said, the look as a whole works very well and the rest of the design comes together nicely. Inside the bold style continues, and it’s accentuated by high-quality materials throughout the cabin. The NX looks and feels like a higher end vehicle than you’d expect at this price and as an entry-level model. The interior is luxurious and big enough for four adults. For my needs and uses, the Lexus NX is just the right size despite the more compact size. Even with a smaller overall size, you can still seat five in the Lexus NX. The back seat offers enough legroom for most passengers without cramping the front row. Cargo area is limited compared to other compact SUVs and is closer to what you would find on a subcompact SUV. With the rear seats folded down, you get a decent amount of cargo space. If you opt for the power liftgate with kick sensor, you can wave your foot under the rear bumper to open it when your hands are full. Lexus upgrades the infotainment system for 2018 with an 8-inch screen, up from a 7-inch, and a larger Remote Touch Controller. The screen is easy to read and I like the ability to put two different sections of information on it side-by-side. Using the trackpad control instead of a touchscreen isn’t the best while driving with the Lexus software. There is also no support for Apple CarPlay or Android Auto, which is a notable omission in 2018. Lexus is bringing CarPlay to the 2019 Lexus ES, but there is no promise of upgrades for older models. The bigger screen looks nice, but controlling with the touchpad is distracting while driving. It’s easy to pair Bluetooth and call quality is above average. The 10 speaker premium sound system sounds good, though not to the level of what you’ll find in the RDX or the Volvo XC60. Lexus’ dynamic cruise control works very well and reduces driver fatigue on longer trips. It’s great to see it as a standard feature alongside these other safety features. If you opt for the Premium Package you get blind spot monitoring in addition to other upgrades. This is a handy feature, but not as essential on a smaller SUV like this as on bigger models. It’s still a feature that I appreciate and that works well. If you can afford the $3,720 premium package it’s a nice addition.